A stunning picture! Really beautiful! Gorgeous! I feel like I’m laying on the forest floor staring straight up! 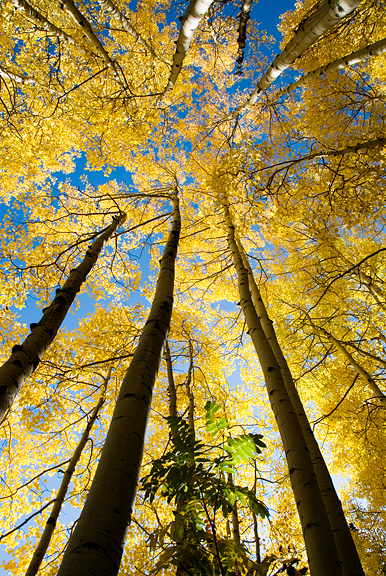 Ah, aspens. Could the sky be any more blue to really highlight those gorgeous golden leaves? Lovely, I could stare at this all day. You can’t imagine how much I love this picture….good luck !!! Wow. What a wonderful picture. I love the mix of the colours and the angle, looking up. Everything about it is amazing! i LOVE this. fall colors and the blue skies are my favorite recipe! great view! Sorry I’m the nerd who’s gonna ask technical questions and not just admire your beautiful work (tho I did that too). Do you always tripod your shots? Even when you’re taking them fast enough that you don’t “need” it? Did you use a filter for this shot? The colors are FANTASTIC. I’m still learning about filters. Just got my first one for my 18-200 VR but it’s just a plain ole UV filter – mostly for lens protection and less for “effect”. Just beautiful!! Shoulda been in the finalists at Greeble. Really. Nice job, wonderful perspective. Of all your photographs, this has been favorite!!! Very emotive and nice diagonals. Lisa – yes, for outdoor shots (unless I’m backpacking and too lazy to pull out the tripod) I tripod about 95%. 1/200 can still get enough shake to ruin a pic. I would rather not risk blowing a money shot, especially since this was low to the ground and was hard to hold still by hand. It was on a steep slope too, so tripod was definitely helpful. I just use a plain UV to keep from smashing my lens :) I don’t like what polarizers do to the sky. I love this shot. Great perspective! !